A Santa Hat. - Red and white Santa coat. Neon Fun Colourful Tutu Skirt Set Hen Party 80s Fancy Dress Party Beads Bangles £2.39. - Santa's' Belt. A beautiful colour transitioning LED light featuring Santa Claus with sparkling glitters swirling inside the figure. Perfect for tabletop display. Decorative Santa's Milk and cookies set with Christmas lights. ceramic plate and glass milk bottle with straw. Perfect Christmas eve present and a future tradition for children. A brightly lit Santa who waves out to your friends and neighbours will surely make you the envy of your neighbourhood. Place the Santa in your garden or light up your front door. FROM ZIP ZAP PRODUCTS! Light up multi colour cell light button included. 15 White Led's. For Indoor and Outdoor Use. Battery Operated. NUOVO Bella in Legno Light Up Glow Buon Natale in legno LED Decorazione del muro Segno. Wonderful Christmas Music Box Decoration. This is a Brand New Polyresin Wind-Up Musical decoration that sees Santas house light up whilst playing Christmas tunes. The kids will love it. The item takes 1 AA Battery. This item measures 5'' across and is about 6.5'' high. It will be well packed and sent Small Parcel Post. Any questions?. Good luck and thanks for your interest. 2ND SET 4 Double Sided Nutcracker Green Hats & 4 Double Sided Nutcracker Blue Hats. 1ST SET 4 Double Sided Snowman & 4 Double Sided Santa. 2 Sets Of Character Lights: 1.5m in length 8 Lights With Two Characters. Christmas light up lantern playing Xmas tunes. Flashing Red Stars Santa Hat. Red hat, White trim with red flashing stars. 3 modes, Press button for different flashing modes. Style: Hat. Main Colour: Red/White. Ideal for Christmas party, Fancy dress, Celebrations. The design has a door surrounded by decorations and presents and a elf with a letter to Santa. The rear of the house has a window, car, elves and reindeer and a Christmas tree. The lantern has shaped cut outs to let the light through. Illuminated battery operated stake light. Features red and white LEDs. Warm white LED glow and glitter swirl motion. A terrific Santa pen for Christmas. Press the button on the back and watch his eyes light up and his arms move. Kids will love it. Press the button and see Santa's eyes light up. CHECK OTHER PRODUCTS IN OUR RANGE. Size: 28cm x 28cm. 28cm Santa Stop Here Indoor Light. Flashing Effect Static. A fun, double-sided and light-up indoor decoration. 30 Super Bright LEDs. We aim to provide the highest quality of service. Set Of 2 Light Up Ceramic Christmas Santa Heads Ornaments Colour Changing Battery operated Requires 2 x SR44 batteries - Included. 6cm x 6.5cm Approx . Suitable for indoor and outdoor use. 120 Multicoloured LEDs. Mains powered with a 3m black lead. During that process you will be issued with an RMA number. Dancing Babbo Natale Babbo Natale Rockin ROLLIN CANZONI ROCK N ROLL LIGHT UP H14"
Rock N Roll Singing dancing Father Christmas playing a cool saxophone with a light up base. Dancing Christmas Santa. See photo 12. Colour: Red, silver and green. Health & Beauty. Perfect working order. >> Blossom / Lit Trees. >> 3D Lit Parcels. Cheaper Online Ltd are based in Lancashire, UK. >> Nativity Scenes. Height: 21cm Base:14cm x 10cm. >> String Lights. Ending Soon. > Christmas Trees. Kingfisher Festive Decorazione Di Natale Metallico illuminare Babbo Natale segno sulla sua. Water filled also with glitter to give a sparkling effect power by a small fan in the base. Christmas Decoration -. Konstsmide Christmas lighting. Henrich Hardware Limited. LATE/MISSING PARCEL. Santa certainly has his work cut out for him every year! Can be wall mounted. Festive and fun. Gorgeous resin traditional looking Santa with light up Lantern. This is a beautiful addition to any Christmas display. Sparkling red & green glitter Santa. Fun 'Santa Stop Here!'. light up LED sign. Requires 2 x AA batteries (not included). Decorative LED Glass Light Jar - Christmas Santa. Add colour and style to your home and garden with our range of candle and light jars. Complete with LED lights that require 3 AAA batteries (not included), these light jars are perfect for adding that magical touch to your home, garden or special event. . Ideal for indoor use only. Giftware Trading Tea Light Holder PO-4391, Santa. Cream and red Santa ceramic tea light holder. >> Blossom / Lit Trees. >> 3D Lit Parcels. Cheaper Online Ltd are based in Lancashire, UK. >> Nativity Scenes. 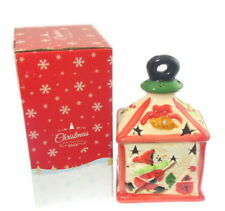 Hand painted porcelain Christmas house with a festive character and Christmas Tree. >> String Lights. Height: 80cm. Illuminated battery operated stake light. Features red and white LEDs. Light up festive houses Great decoration for the Christmas period Colour: Multi-coloured Size: 30.5cm . Images shown are for demonstration purposes. Suitable for indoor use only. 30 White LEDS. Cable length: 5m. Country of Origin: China.